Perpetual Yo-Yo dieter wanting so badly to enjoy good food and fun without guilt and a constant 20 pounds up and down battle fighting genetics and creepy voices in her head…..versus….marathoner who enjoys good food, maintains a steady weight within 2-3 pounds of itself, who has told genetics they can go hide somewhere while she wins the war, and only has voices of determination telling her to go on. Reminders are great motivation. In fact, experts will tell you that it behooves us not to look at how far we still have to go, but how far we’ve come. (Not true at mile 3 of a marathon. Being only 3 miles in is equally as depressing as assessing that you have a total of 26.2 miles to go). I will admit that looking back at pictures of the old Jessica is oftentimes humiliating. I just can’t believe I looked like that. I am one of the rare people that can say I look better in my thirties than I did in my teens and 20’s. With the exception of a small bout with teenaged induced anorexia where I wanted to test myself and my parents and get lots of attention, I have been chubby and struggled with body image my whole life. I keep “fat” pictures on my phone so that I can look at them periodically to fuel my resolve and intensify my motivation. I come from a long line of sick people. I am pretty much a genetic land mine, a walking disaster. Because my dad’s side of the family is made up of amazon people, I pretty much had come to accepting and being okay with the fact that I would be big my whole life. Being thin was not in the cards for me. We are all tall and big boned. Fact: You can’t alter your bone structure or shrink your ribcage. Whew, glad I was able to release that pressure for you. 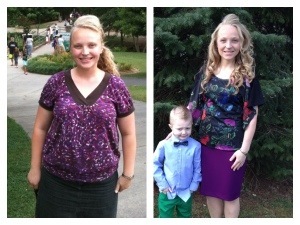 I am to a place now where I am not striving to be a size 0 or a size 2. The numbers on a scale do not rule my life. I count calories, but they do not consume my thoughts, motives, or intentions, nor do they deter me from celebrations and fun. They are just a gauge of where I should be 80% of the time to function at my highest capacity. My bones weigh more than a cousin of mine soaking wet on my mom’s side who I could run circles around fitness wise and that is OK. Sometimes out of shape people will be skinnier and prettier than me. I am not trying to be them. I am trying to be the best version of ME. I want to be well rounded in mind, body, and Spirit. Skinny does not equal fit. Strong equals fit. Healthy equals fit. Determined equals fit. Motivated equals fit. Because diabetes, heart disease, kidney failure, and cancer all run rampant, foot loose and fancy free in my family, digging deep for motivation isn’t really that difficult. What is difficult though is knowing what to do with the fact you are a ticking time bomb and the fact you know that change is necessary. I have read so many books on the subject that I should have an honorary degree in nutrition, however, unfortunately, knowledge doesn’t translate into results or actions. Only my hand to plow can make things materialize. What– Health. Wellness. Fitness. Strength. Good Looks. Positive Attitude. Energy. Strong Spirit. Where– Wherever I am at in this moment. Start where you are and grow from there. Your destination is not nearly as important as your direction. Be constantly moving in the correct direction no matter what pace you are going or plan you are following. Why– Life and death depend on it. I have a calling of God on my life I need to fulfill. My husband, sons, friends, and family need me. I need myself to feel energized, favored, attractive, healthy, and strong so that I can accomplish everything possible in this life. I need to live out my dreams. I need to LIVE not EXIST. How-Research. Research. Research. Just get off the sidelines and START. Do it without fads, gimmicks, and quick schemes. Live the way the cavemen, Jesus, Adam and Eve, and every other random human did before processed plants and food additions came along. If it has a mother or came from the ground, you should probably eat it. If you can’t pronounce it or it’s full of things manufactured in a science lab, run far away from it. 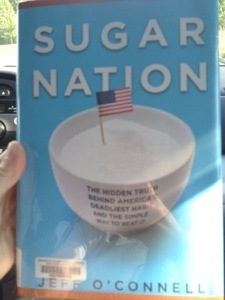 I just finished “Sugar Nation” by Jeff O’Connell. You can follow them on twitter @sugar_nation. This book was especially intriguing to me because my main motivation for this journey was my family history of illness and watching people all around me struggle with diabetes and obesity. The fact that the author himself was relatively in shape when he was diagnosed pre-diabetic, has me on a renewed quest to be even more healthy and take even a greater role in managing my diet. I am more determined than ever to run, run, run, and try to educate people about the truth of what they are consuming. I highly recommend that you read this book, especially if there is any increased risk of you getting diabetes. If you listen to the government for all of your eating advice and rely on them to tell you what is good and give you pretty little pyramids and take care of you, then you are just an uninformed citizen. Get the facts on everything from food to social issues. Don’t believe hype. These books provide some strong facts and arguments about health, wellness,and food that you aren’t hearing in the anti-obesity campaigns. As a former fat person and now a marathon runner focused on wellness with a deep, long family history of diabetes and fear of being fat again or living an exhausted, unhealthy existence instead of enjoy the abundant life God has for me, I loved this book. 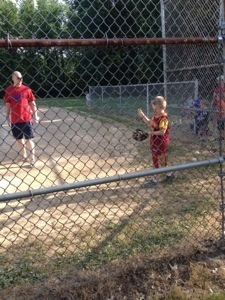 Reese burning calories and helping to coach the 5 year old team. What motivates you to get up and work out when everyone else is lounging? Thank you so much for posting this! I have a few random tidbits to say so here goes. I completely agree that skinny does not equate to being fit. I am very very skinny and very tall as well. People look at me and think, “man he must be pretty healthy and active.” As a matter of fact, I’m not! (Or at least I wasn’t until pretty recently.) This proves that looks can be deceiving. I also have a lot of family history in regards to diabetes and heart disease. This frightens me a lot because as a nursing student, I know how rampant these diseases can run through people. 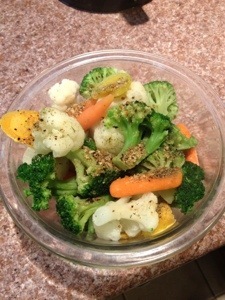 I want to be healthy. I want to be able to live a long life. I want to feel good and be energized. I love God and for the past 6 months to a year I have had a strong conviction about my lifestyle. I wasn’t treating my body right and the Holy Spirit was definitely letting me know. I was eating horribly (which I’m working on!) and I was a couch potatoe. I wasn’t fit. My body is a temple, as you know. I need to treat it as such. I need to be healthy so that I can take the gospel to all nations. I love The Lord, which means I should probably honor Him in with the body he gave me. I was a chubby kid and always felt horrible until I had a growth spurt. I often think back to how I was bullied and that gives me a lot of motivation. Motivation to be different than what those people said to me. Motivation to be a healthy version of me. 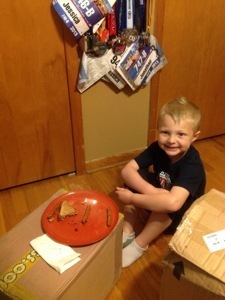 Awesome blog about working towards healthy living. It’s worth it.